The Shoalhaven Entertainment Centre hosts a variety of live shows, concerts, conferences, presentations, expos and more! Clean, comfortable and friendly. 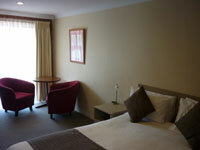 The Bomaderry Motor Inn is close to many facilities and attractions. Your perfect base for business or fun! Gary and San-Dee welcome you to our three and a half star motel offering 23 ground floor, air conditioned units, all with free wifi, Foxtel television and tea and coffee making facilities. Family rooms with second bedrooms and kitchenettes are available or you may prefer one of our apartments with full cooking facilities. Breakfast is available and delivered straight to your room from 7.00am Monday to Friday and from 8.00am Saturday, Sunday and all public holidays. Once you've settled in, you can relax in our outdoor saltwater pool, or host a gathering at our free poolside barbecue. Enjoy a scenic walk through the surrounding bush tracks, or take a short drive to one of the many local attractions the beautiful south coast has to offer.